The Fresh Produce Preservation Project (FPPP) was started in 2010. Milwaukee area food sources donated large amounts of extra produce and the Gathering staff and volunteers froze and preserved the produce to be used in winter meals. Since 2010, the FPPP has relied on many volunteers who have preserved approximately 5,938 pounds of corn, zucchini, green beans, tomatoes, basil, bell peppers, apples, onions and more. As someone who came into the project with a lot of interest but not a lot of answers, I am amazed when I think about all I have learned in my first year with the FPPP. From freezing, canning and food handling courses to practicing recipes and interacting with some really positive and motivating volunteers, it has been a year of real growth. In the off season this year, I have been lucky enough to meet with a lot of Milwaukee area food preservationists and food justice organizations. Everyone I have come in contact with has been supportive of the FPPP’s mission and has offered to circulate information or help with produce donations. Through these connections I hope to strengthen the project’s presence in Milwaukee as well as increase produce donations. One particularly interesting connection the FPPP has made this year has been with the Cultures and Communities Program office at UW-Milwaukee, thanks to a Community-University Partnership grant. With this grant, the Gathering will be teaming up with Dr. Phillips (Program Coordinator of the Conservation and Environmental Sciences department) on a project entitled, “Practical Approaches to a Sustainable Future with the FPPP.” Through this project, twenty students will be growing their own produce in garden beds on campus. The students will then harvest the produce and, through a preservation session with The Gathering staff and volunteers, will preserve it and donate it to the FPPP where it will be used in winter meals. Special Thanks to everyone who volunteered last season! In order to answer the question – “How do we become better stewards of our resources while providing healthy meals for our guests?” - the Gathering started the Fresh Produce Preservation Project. The project started in 2010 with just a dozen volunteers. 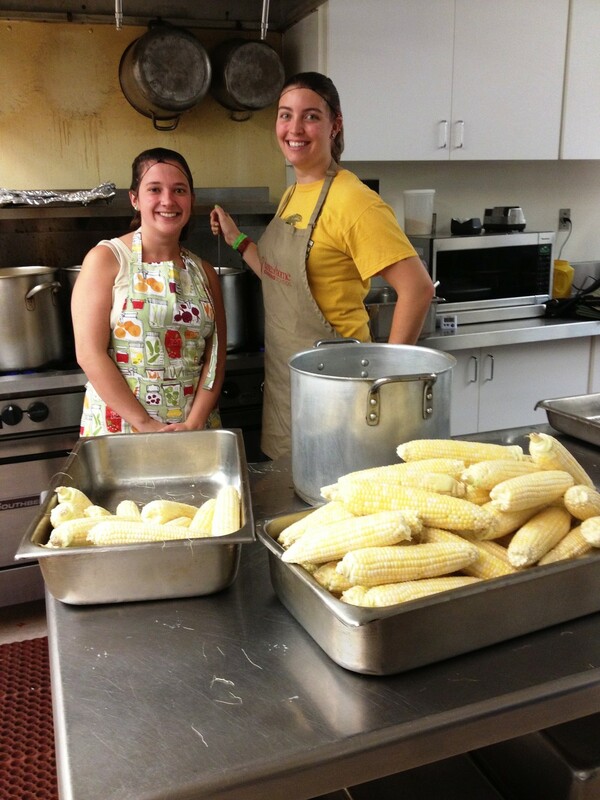 These volunteers prepared produce donations from farms, gardeners and food banks around the area. The produce was then frozen and added to the Gathering’s community meals (breakfast, dinner and Saturday lunch) throughout the winter months. Now, over 7000 pounds of produce and 75 volunteers later, the project is gearing up for its third season. Already this season (after just two preservation sessions) volunteers have prepared 148 pounds of tomatoes and 40 pounds of green beans. These vegetables will be used in soups, lasagnas, sauces and other delicious, nutritious dishes in the coming months. Even now, while you are reading this, faithful produce volunteers are rolling up their sleeves, tightening their apron strings and snapping on their hair nets in preparation for a large donation of bell peppers that just arrived. One such faithful produce volunteer is Janet. Janet has been a volunteer with the produce preservation project since the beginning. Janet first heard about the project through her church. She made connections with other volunteers and had such a great time that she kept coming back: “The community spirit of the Gathering is what keeps me coming. I love the talking and slicing together” Janet said. Janet spent the majority of the past two produce sessions stuffing and weighing freezer bags full of peeled tomatoes and fresh green beans and is looking forward to more produce in the weeks to come.